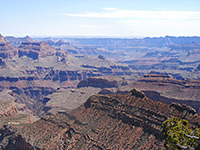 The southernmost point on Grand Canyon's south rim is Grandview, reached by a one mile side road, and looking out over a wide bend in the Colorado half way between Desert View and Grand Canyon Village. This is also the point furthest from the river and so with the largest area of intervening buttes and ravines; the Colorado is 4 miles distant, and the cliffs at the rim are generally less steep than at other, closer overlooks, allowing a relatively easy trail to descend into the canyon (Grandview), though this does not go all the way to the river as the granite cliffs of the inner gorge are too sheer. 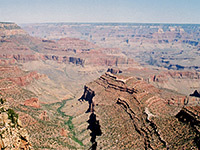 The course of the Grandview Trail is quite evident from the rim, as it descends along the side of a narrow ridge towards Horseshoe Mesa, a U-shaped formation between Cottonwood Creek to the west and Hance Creek to the east, and once the site of a copper mine. Further west is the branched drainage of Grapevine Creek, which meets the river at a lengthy set of rapids though these too are out of sight - the only glimpse of the Colorado from Grandview Point is quite far to the northeast, at the mouth of Tanner Canyon. The best views at the point are found a short distance down the Grandview Trail, since the official overlook is slightly obstructed by trees. Grandview is quite a high elevation point (7,400 feet) so receives more rainfall and hence the woodland is taller and denser, containing a mix of oak, ponderosa pine and pinyon pine. Before the construction of El Tovar Lodge near Garden Canyon, Grandview was the first place along the rim to be developed for tourists, with facilities including a hotel built in 1895, but this became disused after only a few years of operation, and little trace remains today.